Is your family already talking about Thanksgiving? Both mine and Eric’s family are talking about Thanksgiving, even though it is still two and a half months away. My family is discussing plans, like who is flying into town and when, who will host, and how many people to expect. Eric’s family on the other hand, is merely discussing important details…. The food! I had to crack up when at our Labor Day cookout, Eric’s brother started rambling on and on about Thanksgiving and all the food we cook just for that holiday. He told his girlfriend that she was in for a treat (she hasn’t experienced a Thanksgiving with us yet) with his famous fried turkey, my cornbread dressing, his Mom’s sweet potatoes and the bounty of desserts! Not to mention rowdy football watching (which I don’t know how rowdy we will be this year with the end of the Texas A&M vs University of Texas Thanksgiving rivalry game). Whether you are already planning your Thanksgiving, or simply need dessert to bring to Sunday dinner, this pie will make you more friends than you can count! I made this for our last big holiday dinner, Easter, and don’t know why I have been sitting on the recipe for so long! 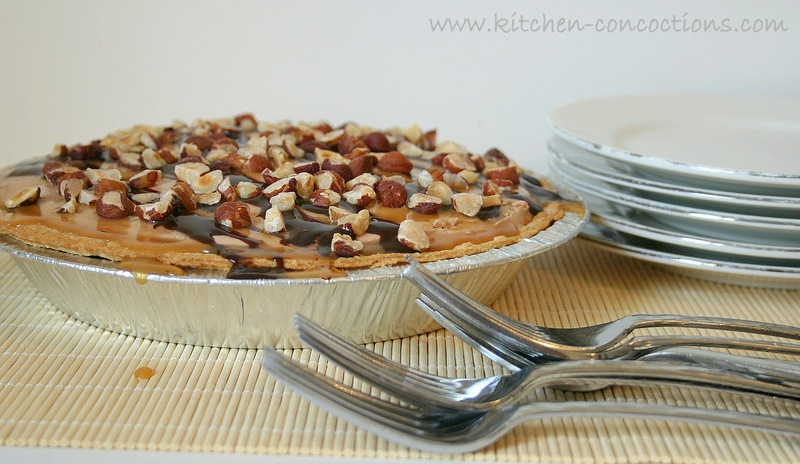 This pie has a flaky crust with a rich and creamy filling, which is then topped with hazelnuts and decadent chocolate and caramel syrup. If you are looking for a dessert that will be gone in the blink of an eye this is the one for you! Allow pie shell to thaw at room temperature for approximately 10 minutes. Use fork to prick bottom and sides of pie shell several times to ensure even baking. Place pie shell on cookie sheet on center oven rack. Bake pie shell for 10 – 15 minutes until golden brown. Remove pie shell from oven and allow to cool for at least 15 minutes before filling. Meanwhile, in large bowl, beat cream cheese, chocolate hazelnut spread, vanilla and sugar with electric mixer on medium speed until smooth. Carefully fold in whipped topping until blended. Reserve 1 tablespoon each of the caramel and chocolate syrup; set aside. 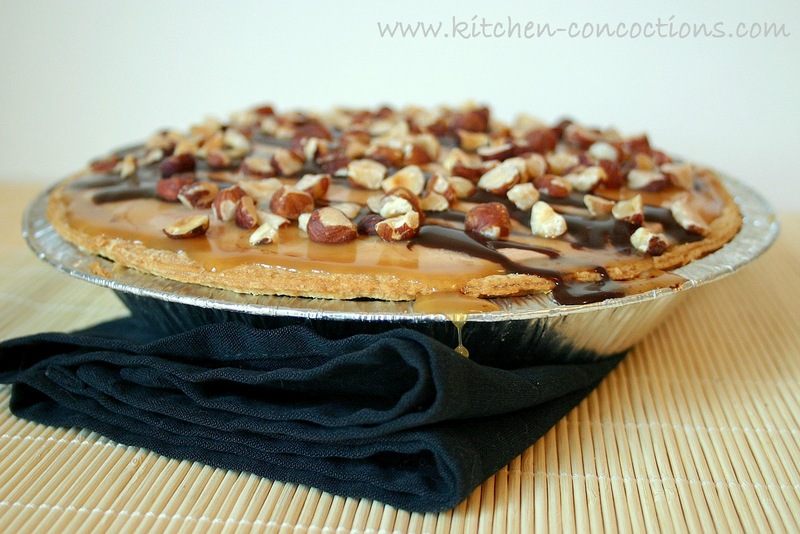 Evenly drizzle remaining caramel and chocolate syrup into cooled pie crust; spread evenly. Spoon and spread cream cheese mixture over caramel/chocolate syrup layer. 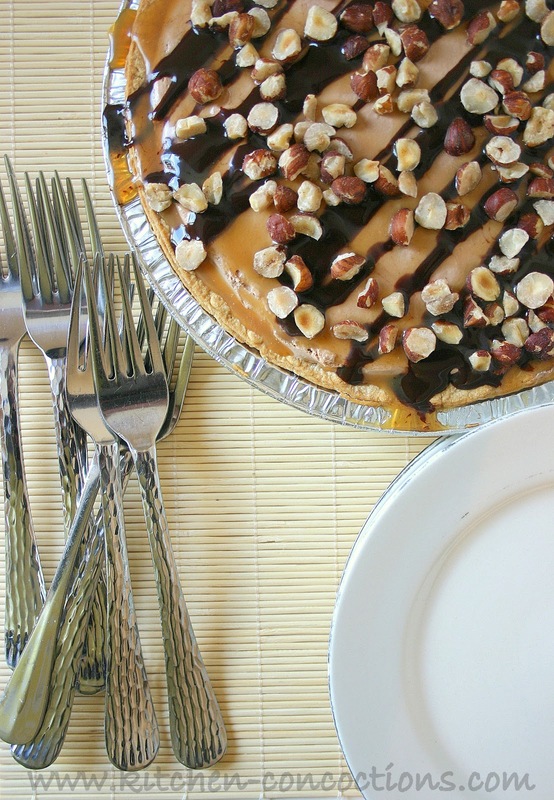 Right before serving, drizzle reserved chocolate and caramel syrup over top of pie; sprinkle with chopped hazelnuts. Store covered in refrigerator. This is one gorgeous pie! I wish I had a piece right now!